This manuscript presents an injection molding method to engineer microvessels that recapitulate physiological properties of endothelium. 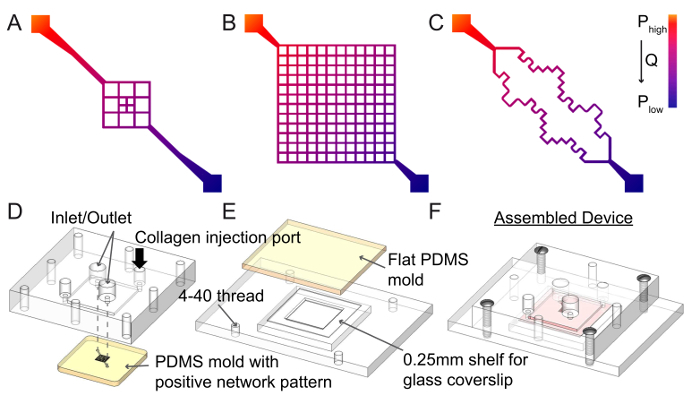 The microfluidic-based process creates patent 3D vascular networks with tailorable conditions, such as flow, cellular composition, geometry, and biochemical gradients. The fabrication process and examples of potential applications are described. Roberts, M. A., Kotha, S. S., Phong, K. T., Zheng, Y. Micropatterning and Assembly of 3D Microvessels . J. Vis. Exp. (115), e54457, doi:10.3791/54457 (2016). In vitro platforms to study endothelial cells and vascular biology are largely limited to 2D endothelial cell culture, flow chambers with polymer or glass based substrates, and hydrogel-based tube formation assays. These assays, while informative, do not recapitulate lumen geometry, proper extracellular matrix, and multi-cellular proximity, which play key roles in modulating vascular function. This manuscript describes an injection molding method to generate engineered vessels with diameters on the order of 100 µm. Microvessels are fabricated by seeding endothelial cells in a microfluidic channel embedded within a native type I collagen hydrogel. 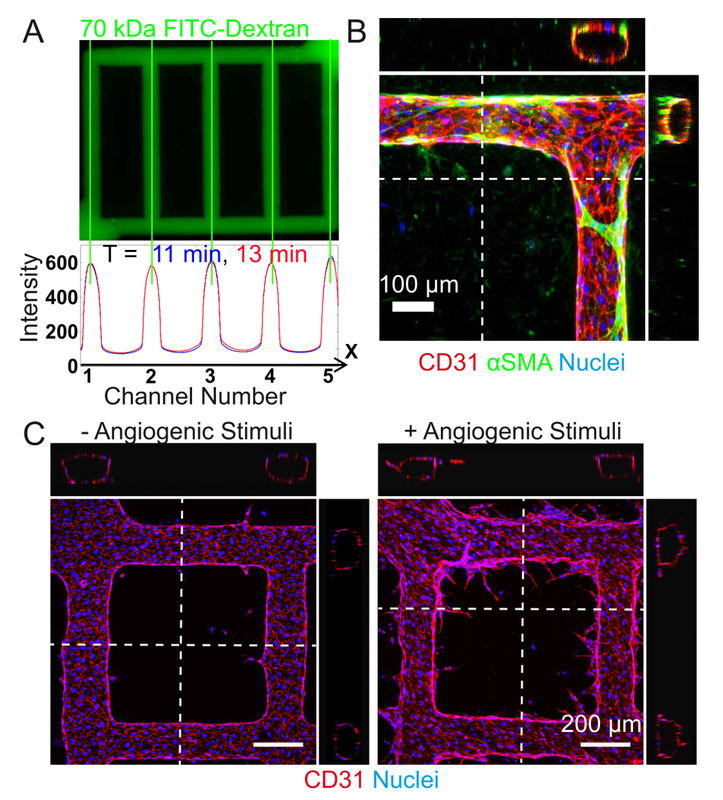 By incorporating parenchymal cells within the collagen matrix prior to channel formation, specific tissue microenvironments can be modeled and studied. Additional modulations of hydrodynamic properties and media composition allow for control of complex vascular function within the desired microenvironment. This platform allows for the study of perivascular cell recruitment, blood-endothelium interactions, flow response, and tissue-microvascular interactions. Engineered microvessels offer the ability to isolate the influence from individual components of a vascular niche and precisely control its chemical, mechanical, and biological properties to study vascular biology in both health and disease. The microvasculature in each organ helps define the tissue microenvironment, maintain tissue homeostasis and regulate inflammation, permeability, thrombosis, and fibrinolysis 1,2. Microvascular endothelium, in particular, is the interface between blood flow and the surrounding tissue and therefore plays a critical role in modulating vascular and organ function in response to stimuli such as hydrodynamic forces and circulating cytokines and hormones 3-5. Understanding the detailed interactions between the endothelium, blood, and the surrounding tissue microenvironment is important for the study of vascular biology and disease progression. However, progress in studying these interactions has been hindered by limited in vitro tools that do not recapitulate in vivo microvascular structure and function 6,7. As a result, the field and therapeutic advancement has relied heavily on costly and time-consuming animal models that often fail to translate to success in humans 8-10. While in vivo models are invaluable in the study of disease mechanisms and vascular functions, they are complex and often lack precise control of individual cellular, biochemical, and biophysical cues. Vasculature throughout the body possesses a mature hierarchical structure in conjunction with expansive capillary beds, providing optimized perfusion and nutrient transport simultaneously 11. Initially, vasculature forms as a primitive plexus which reorganizes to a hierarchically branched network during early development 12,13. Although many of the signals involved in these processes are well understood 14-16, it remains elusive how such vascular patterning is determined 15. In turn, recapitulating this process in vitro to engineer organized vascular networks has been difficult. Many existing in vitro platforms to model vasculature, such as two dimensional endothelial cell cultures, lack important characteristics such as multi-cellular proximity, three dimensional luminal geometry, flow, and extracellular matrix. Tube formation assays in 3D hydrogels (collagen or fibrin) 17-19 or invasion assays 20,21 have been used to study endothelial function in 3D and their interactions with other vascular 17,22 or tissue cell types 23. However, assembled lumens in these assays lack interconnectivity, hemodynamic flow, and appropriate perfusion. Furthermore, the propensity for vascular regression in these tube formation assays 24 prevents long term culture and maturation which limits the degree of functional studies that can be performed. Thus, there is a burgeoning need to engineer in vitro platforms of microvascular networks that can appropriately model endothelial characteristics and are capable of long term culture. A variety of vascular engineering techniques have emerged over the years for medical applications to replace or bypass affected vessels in patients with vascular disease. Large diameter vessels made from synthetic materials such as polyethylene terephthalate (PET), and polytetrafluoroethylene (ePTFE) have had considerable therapeutic success with long term patency (average 95% patency over 5 years) 25. Although small diameter synthetic grafts (< 6 mm) typically face complications such as intimal hyperplasia and thrombopoiesis 26-28, tissue engineered small diameter grafts made with biological material have made significant progress 29,30. Despite advancements of this kind, engineered vessels on the microscale have remained a challenge. To adequately model the microvasculature, it is necessary to generate complex network patterns with sufficient mechanical strength to maintain patency and with a matrix composition that allows for both nutrient permeation for parenchymal cells and cellular remodeling. This protocol presents a novel artificial perfusable vessel network that mimics a native in vivo setting with a tunable and controllable microenvironment 31-34. The described method generates engineered microvessels with diameters on the order of 100 µm. Engineered microvessels are fabricated by perfusing endothelial cells through a microfluidic channel that is embedded within soft type I collagen hydrogel. This system has the capacity to generate patterned networks with open luminal structure, replicate multi-cellular interactions, modulate extracellular matrix composition, and apply physiologically relevant hemodynamic forces. Create a network pattern using any computer-aided design (CAD) software. Ensure that the diagonal dimension between the inlet and outlet match the distance between the inlet and outlet reservoirs on the housing devices in future steps (see 2.1.1). Note: The design of the pattern itself is custom depending on the specific research goals of the user (see Figure 1 for example patterns). Generate a mask of the network pattern using high resolution printing or order a chrome photomask from a commercial supplier. A more detailed protocol of the photolithography process is available elsewhere 35. Clean an 8" silicon wafer for 5 min at 100 W with oxygen plasma treatment. Pour enough negative photoresist (SU-8 2,100 works well) onto the wafer such that the resist forms a dollop with diameter of 2.5 cm. Using a spin coater, spin the wafer at 500 rpm with 100 rpm/sec ramp and maintain for 10 sec. Then ramp up to 1,600 rpm with 300 rpm/sec and maintain for 30 sec. Note: The speed and ramp need to be optimized for each laboratory condition to yield a resist thickness of 150 µm. Soft-bake the wafer at 65 °C for 7 min, ramp up to 95 °C with 360 °C/hr, and maintain for 45 min. Slowly cool down to room temperature on the hot plate. Imprint the vessel pattern onto the coated wafer by exposure to 365 nm UV light under a chrome photomask, with exposure triple that of the manufacturer's recommendation (350 mJ/cm2 for a SU-8 thickness of around 150 µm). Note: Since SU-8 is a negative resist, the exposed regions (everything except the pattern design) will become insoluble to the developer in step 1.1.7. Hard-bake the exposed wafer at 65 °C for 5 min and ramp up to 95 °C with 360 °C/hr and maintain for 25 min, then allow it to slowly cool down to RT on the hot plate. Immerse the wafer in SU-8 developer for 10 - 15 min to wash away unexposed resist, then clean with isopropyl alcohol and dry under a compressed nitrogen flow. Inspect the pattern under a light microscope to ensure the SU-8 resist is well bonded to the wafer (look for unwanted peeling and bubbles). Measure the thickness of the pattern features using a profilometer according to manufacturer's instructions 36. During measurement acquisition, avoid regions of the structure that are essential for network function (i.e., inlet and outlet conduits) as a contact based profilometer could compromise the structural integrity of the patterned features on the wafer. Alternatively, use a non-contact method (i.e., optical profilometer) to avoid this issue altogether. Note: Handle silanes within a chemical fume hood. Place the wafer in a desiccator with 100 µl of trichloro(3,3,3-trifluoropropyl)silane for 2 hr to silanize the surface. Transfer silanized wafer into a 120 x 120 mm square Petri dish. Pour mixed and de-gassed PDMS elastomer and curing agent (10:1 w/w ratio) over the wafer to achieve 4 - 6 mm thickness. Pour additional PDMS into a separate 120 x 120 mm square Petri dish to generate flat molds without patterns. Cure at 65 °C for 2 hr. Remove from oven and allow the PDMS to cool to room temperature. Using a scalpel carefully cut a square around the SU-8 and slowly peel off the PDMS mold from the wafer. Trim edges to 30 mm x 30 mm. For flat molds, cut cured PDMS without an imprinted pattern into square pieces about 40 mm x 40 mm. Fabricate vessel housing using poly(methyl methacrylate) (PMMA). To fabricate, order the parts from a standard machine shop with computer numerical controlled (CNC) milling capabilities. See Figure 1 for a schematic of the top and bottom pieces. Design the top housing piece (Figure 1D) to include a 20 mm x 20 mm well on the underside of the device with a depth of 1 mm, two collagen injection ports (4 mm diameters) on the top of the device located at the corners of the square well, two inlet and outlet reservoirs with 6 mm diameters, and four screw holes (3 mm diameter) at the four corners of the device. Note: Additional holes may be drilled on the periphery of the piece for handling purposes. Design the bottom housing piece (Figure 1E) to include a square hole in the middle (dimensions 15 mm x 15 mm) with a surrounding 25 mm x 25 mm shelf with a depth of 0.25 mm. Drill 4 screw holes with 4-40 thread. Ensure the screw holes in the bottom and top pieces will align together during future assembly steps. Wash and autoclave two sets of tweezers, a stainless steel spatula, a small flat screw driver, stainless steel screws, and several stainless steel dowel pins. For the fabrication of the vessels, also autoclave micropatterned PDMS molds, PDMS flat squares, glass coverslips (22 x 22 mm), and cotton pieces. Sterilize the PMMA housing pieces in bleach for at least 1 hr, then rinse with autoclaved water in the tissue culture hood twice, and allow to air dry in sterile tissue culture dishes (150 mm x 25 mm). Treat inner wells of sterilized dry PMMA pieces with plasma for approximately 1 min. Add 1% Polyethyleneimine (PEI) onto the inner wells (the 20 mm square well on the top and the 25 mm square shelf on the bottom) of the PMMA pieces for 10 min. Rinse with sterile H2O and allow to dry in the tissue culture hood. Note: The time needed for plasma treatment is variable depending on the device used - the PEI should spread easily indicating a hydrophilic surface. If not, additional plasma treatment may be necessary. Apply 0.1% glutaraldehyde (GA) onto PEI treated surfaces of the PMMA pieces for 30 min. Rinse twice with sterile water and allow to dry. Note: In future steps, collagen will adhere to the coated surface through collagen-glutaraldehyde crosslinking. This helps secure the gel in place within the device during future assembly steps and throughout the device culture period. Fabricate vessels using 0.6% - 1% collagen solutions. To make 0.75% collagen for vessel fabrication, mix type I collagen stock solution (1.5% - isolated from rat tails 37) with sodium hydroxide (NaOH),10x Media Supplement (M199), and cell culture media. Keep all solutions on ice. Determine the volume of collagen by the following equation, where Vƒinal is the final volume of gel required (typically, 1 ml of collagen per device is sufficient), Vstock collagen is the volume of stock collagen needed, Cstock collagen is the concentration of the stock collagen, and Cƒinal collagen is the desired concentration of the collagen in the vessel. Add the mixture of neutralizing reagents (V10X, VNaOH, V1X) to the aliquoted collagen, and use a small spatula to gently mix the solution until a homogeneous gel is obtained. Avoid introducing bubbles by stirring slowly and gently. To incorporate cells into the matrix at the desired concentration (e.g., 0.5 - 20 million cells/ml), add the cells to the collagen solution after it is mixed with the neutralizing reagents, and continue to stir until the cells are homogeneously distributed. When cells are added, adjust the volume of cell culture media to accommodate the additional volume, as determined by the following equation, where Vcells is the required volume of the cell suspension, Cƒinal cell density is the desired density of cells in the vessel, Csuspension cell density is the density of cells in the stock solution. Place the micropatterned PDMS mold in a 100 mm x 20 mm dish. Plasma clean the PDMS mold for 1 min. Align the top PMMA piece on top of the PDMS mold so that the square reservoirs on the mold are directly under the inlet and outlet reservoirs (see Figure 1D - dashed lines). Place the stainless steel dowel pins into the inlet and outlet reservoir holes on the top PMMA piece to maintain clear access from the reservoirs to the pattern. Use a 1 ml syringe to extract ~ 0.5 - 0.6 ml collagen. Ensure that no bubbles remain in the syringe. Press down lightly with tweezers on the top housing to ensure flush contact between the top piece and the PDMS mold. Inject collagen slowly through an injection port on the top PMMA piece. Check that collagen fills in the 20 mm x 20 mm domain above the pattern and does not leak out. Close the dish without jostling the dowel pins and allow to gel in a 37 °C incubator for 30 min. Place a 22 x 22 mm glass coverslip in the center of the bottom piece. Use a 1 ml syringe to dispense ~ 0.25 ml collagen evenly onto the glass slide. Gently lower the PDMS flat square over the collagen, ensuring the PDMS is flat against the PMMA and there are no trapped bubbles. Allow to gel at 37 °C for 30 min. After gelation, add enough PBS around the flat PDMS piece on the bottom piece to surround the PDMS (about 1 ml). Use tweezers to remove any excess collagen around the edges, and slowly peel off the PDMS piece. Add more PBS on top of the collagen to maintain hydration. To prepare the top piece, use tweezers to pick up the top PMMA piece and flip it over so that the PDMS mold is on top. Add a few drops of PBS to the interface, then quickly and firmly remove the PDMS mold from the top PMMA piece. Gently remove stainless steel dowel pins from the other side of PMMA housing using another pair of tweezers. Add several more drops of PBS onto the micropatterned collagen. Flip the PMMA top piece over so that the collagen faces down and place 4 screws into the corner holes. Gently lay the top piece on top of the bottom piece, aligning the screws with the corner holes on the bottom piece. Do not allow the two pieces to slide against each other. Use a screwdriver to tighten the screws using a gentle touch. Do not overtighten. Aspirate the PBS surrounding the PMMA surfaces and place a small piece of cotton under one edge of the device. Using a pipette, remove any PBS from the reservoirs and replace with cell culture media. Allow the device to gel together in a 37°C incubator for at least 1 hr. Culture human umbilical vein endothelial cells (HUVECs) in endothelial growth media at 37 °C (CO2, O2) to confluency 38. Whenever possible, use between passages 4 and 7. Trypsinize endothelial cells by washing the culture flask with 6 ml of PBS and then adding 2 ml of 0.05% trypsin at 37 °C to dissociate the cells. Leave the cells in trypsin until most of the focal adhesions have detached and the cells are rounded up (this typically takes about 2 - 3 min). Stop the trypsin reaction by adding 4 ml of endothelial growth media containing fetal bovine serum (FBS). Wash the flask with the media several times to ensure the cells are detached from the flask and collect in a conical tube. Count the cells using a hemocytometer and resuspend them at a density of 10 million cells per ml. Remove all cell culture media from the inlet and outlet reservoirs. Using a 200 µl gel loading tip, add 10 µl of cell suspension into the center of the inlet reservoir. The cells should begin to flow into the network immediately and coat the network. Add 200 µl media equally to both reservoirs and let cells attach and spread within the network for at least 1 hr. Culture the device with gravity driven flow through the network by adding 200 µl of cell culture media to the inlet reservoir and 50 µl to the outlet reservoir. With this method of culture, replace media every 12 hr to maintain endothelial viability. Note: If continuous flow culture conditions are desirable (to maintain constant shear stress, collect media at the outlet, etc.) a syringe pump may be used instead of gravity driven culture. Allow the seeded endothelial cells at least 24 hr to attach and stabilize before applying continuous flow. Prior to continuous flow setup, maintain the devices with gravity driven flow conditions. NOTE: The media conditions for applied flow differ from gravity driven culture. The addition of a plasma expander, such as dextran, to the media stabilizes the engineered microvessels and prevents vascular collapse during sustained perfusion 39. To make media for continuous flow setup, dissolve 3.5% Dextran (70 kDa) in endothelial growth media for optimal vessel culture. Using sterile technique, fill 10 ml syringes with endothelial growth media with 3.5% Dextran. Prepare a sterile culture dish for flow by melting holes in the side wall of a Petri dish using a soldering iron. Attach 12" silicon tubing (1/32" ID) to a Luer lock coupling (Female, 1/16" ID), and a 1/16" straight tube-to-tube connector with a 1" segment of tubing on the other end. Insert a 1/4" 20G blunt needle (detached from the needle hub) to the free end of the 1" segment. Also prepare a 3" segment of tubing attached to a tube-to-tube 90° elbow connector joint (to be fitted in the housing inlet). In subsequent steps, the longer tubing will be threaded through the prepared dish and attached to the 3" segment via the 20 G needle. Outlet tubing should mirror inlet tubing, with a free end instead of a Luer lock coupling. Autoclave all segments prior to use. Thread autoclaved inlet and outlet tubing through holes in the prepared dish. Attach 3" segments to inner 20 G needles. Attach the Luer lock coupling to the media-filled syringe and perfuse media through the tubing using the syringe pump set at a high flow rate. Ensure that there are no bubbles in the tubing or connectors, as these will impede flow to the vessel. Insert the connector joint into the housing inlet. Set the syringe pump to the desired flow rate and begin perfusion. NOTE: This can be adjusted depending on the vessel geometry and experimental conditions of applied shear stresses. For a 100 µm diameter channel, a flow rate of 3 µl/min works well. If desired, collect perfusate with prepared outlet tubing inserted into a sterile 5 ml polystyrene round bottom tube containing 500 µl of media. Note: A small amount of media is added to the collecting tube to prevent bubble formation that can block flow. Depending on flow rate, the syringe may need to be refilled after 24 to 36 hr. This is done by removing the connector from the housing inlet, replacing the syringe, and allowing media to perfuse at a high flow rate for several min. This sequence ensures that bubbles are not introduced to the tubing. Reset the pump to the desired flow rate for culture, insert the connector into the housing inlet, and return to the incubator. Use 40 kDa FITC-Dextran to visualize the permeability of the vessel in situ. Place the vessel housing on a confocal microscope and focus at the vessel plane. Add 5 µM 40 kDa FITC-Dextran to the inlet and image at 4X magnification, 25 msec exposure time, and at 1 frame per sec for 10 min. Analyze the image series with analysis code to estimate the permeability of Dextran across the vessel wall into collagen (µm/sec) based on a model published by Zheng et. al. 31. To fix vessels, perfuse with 3.7% formaldehyde through the inlet for 20 min and wash by perfusing PBS three times (20 min per wash). Block nonspecific antibody binding with 2% bovine serum albumin (BSA) and 0.5% Triton X-100 perfused through the network for 1 hr. Perfuse primary antibody solutions overnight at 4 °C and wash three times with PBS. Perfuse secondary antibody solutions for 1 - 2 hr, and wash again with PBS in the same manner. Take immunofluorescence images of microvessels in situ using a confocal microscope with a z-step of 1 µm. Image the microvessels at a magnification of 4X, 10X, or 20X. Note: Magnification of 4X will provide global network structure information, while 10X and 20X magnified images will provide cellular details such as elongation, junction formation, etc. Analyze the image stacks using ImageJ with Z projections (Image/Stacks/Z-project), cross sections (Image/Stacks/Orthogonal view), and 3D reconstructions (Image/Stacks/3D Project). For electron microscopy analysis, fix in situ by perfusing half-strength Karnovsky's solution (2% paraformaldehyde/2.5% glutaraldehyde in 0.2 M cacodylate buffer) overnight. Disassemble the vessel and carefully separate the two pieces. Trim edges and fully immerse in the fixative solution for several days. Immerse the thick top portion of the vessel in 25% glutaraldehyde for 20 min and rinse three times with PBS (2 min each). Dehydrate in serial ethanol washes of 50%, 70%, 85% (2 min each) and two washes in 100% ethanol (5 min each). Prepare the sample for analysis with further dehydration by critical point drying following the manufacturer's protocol 40. Sputter coat the vessel with gold-palladium (7 nm) and analyze under a scanning electron microscope with an accelerating voltage of 5 kV, spot size 3. The engineered vessel platform creates functional microvasculature embedded within a natural collagen type I matrix and allows for tight control of the cellular, biophysical and biochemical environment in vitro. To fabricate engineered microvessels, human umbilical vein endothelial cells (HUVECs) are perfused through the collagen-embedded microfluidic network where they attach to form a patent lumen and confluent endothelium. As illustrated in Figure 1A-C, the vessel geometry can be specifically designed to answer questions regarding flow rate, tortuosity, and branching angles, among others. Modulating the flow rate through the microvessels provides insight into the shear stress-response of endothelial cells. Previously, fabrication focus has been primarily on vessels in the 100 µm size range, however microvessels up to 500 µm or, in some cases, as small as 50 µm in diameter have been successfully made and cultured. Examples of long term patency are shown as well as the survival of microvessels cultured under gravity driven flow (Figure 2A) and continuous applied flow (Figure 2B). The in vivo-like properties of engineered microvessels can be demonstrated in several ways. Various endothelial functions can be measured using this platform, including barrier function (Figure 3A), cell-cell interactions and signaling (Figure 3B), and angiogenic remodeling (Figure 3C). A critical feature of these microvessels is their ability to respond to inflammatory stimuli in a biologically relevant manner. This is best demonstrated through their interaction with whole blood in Figure 4A-C where non-activated endothelium is quiescent (Figure 4B) and activated endothelium induces thrombus formation (Figure 4C). By culturing endothelial cells of differing origins within this platform, it is possible to understand the functional heterogeneity between endothelial cells from different sources. Figure 5A-C illustrates an example of this heterogeneity with two different human stem cell-derived endothelial cell types that when cultured in the microvessel system display drastically different phenotypes 41. By tuning the flow profiles, cell composition, and culture conditions, engineered microvessels provide a powerful in vitro tool to study endothelial biology and microvasculature in both health and disease. Figure 1. Schematic of Network Designs and Microchannel Fabrication Protocol. The vascular network geometry can be specifically designed to generate different flow patterns. A. For example, a branched design will have decreased flow rates near the center (an 8 fold reduction in a 3 by 3 grid) resulting in regions of varied shear stress on the endothelium within the same vessel 31. B. A highly branched grid follows the same principle as the previous design but with a larger plexus. With this design, the effects of a 50 fold reduction in flow rate, resulting in a shear rate reduction from 10 to 500 sec-1 can be observed when a pressure drop of 1,000 Pa is applied across the network 32. C. More complex designs such as a tortuous network with sharp corners 32 can be used to answer questions regarding endothelial response to interruptions to laminar flow, which often occur in pathological contexts 42. Microvessels made from these patterns will have a diameter of 100 - 150 µm. D. There are three major steps during microchannel fabrication. First, the top portion of the housing jig is placed on top of the PDMS patterned network mold such that the inlet and outlet are aligned. Collagen I is then injected into the enclosed space through the injection ports (black arrow). Typically, a 0.75% collagen I mixture is used for fabrication. Successful microvessel fabrication can be achieved with as low as 0.6% collagen, however less than 0.6% typically results in insufficient mechanical strength and channel collapse. E. A thin layer of collagen is added to the bottom piece on top of the coverslip, and flattened with another PDMS piece. F. After gelation at 37 °C, the PDMS molds are removed and the top and bottom housing jigs are screwed together to enclose the network. Please click here to view a larger version of this figure. Figure 2. Microvessels Cultured with Controlled Flow Profiles. A. HUVECs seeded in microvessels cultured under gravity driven flow and B. applied continuous flow at a rate of 3 µl/min. Culture under applied flow is best achieved with the addition of 3.5% Dextran to the media which has been shown to stabilize microfluidic collagen-based microvessels by exerting physical pressures within the lumen that enhance junction formation, although the exact mechanism driving this effect is unclear 39. Microvessels were stained for the endothelial junction protein CD31 or cluster of differentiation 31 (red) and von Willebrand factor (VWF) granules (green). A', B'. In both conditions, HUVECs expressed endothelial markers of cell-cell junctions and VWF granules. A", B". Orthogonal views show patent and rounded lumens after 6 days in culture. Please click here to view a larger version of this figure. Figure 3. Engineered Microvessels for the Study of Endothelial Function. A. Endothelial barrier function can be assessed after perfusion of FITC (Fluorescein isothiocyanate)-conjugated Dextran through the networks (top) and subsequent measurement of its diffusion into the bulk collagen (bottom). Using custom code, videos of the perfusion can be analyzed to plot pixel intensity over a region of interest within the frame over time to determine the permeability coefficient K (µm/sec) of the FITC-Dextran. Previous publications by the lab have demonstrated that the permeability of these engineered vessels is comparable to that of ex vivo mammalian vessels 31,43. B. Endothelial cell interactions with perivascular or support cells can be analyzed in this platform by modulating the cellular composition of the collagen matrix. 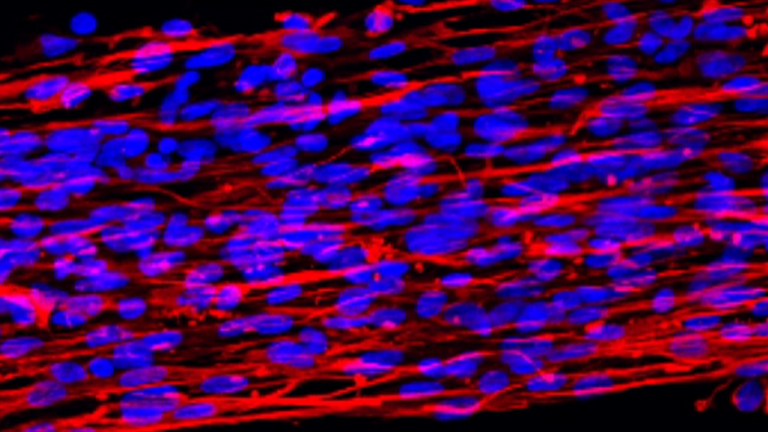 Here, an example of these cell-cell interactions can be seen when smooth muscle cells are embedded within the collagen surrounding the vessels. After 14 days in culture, the smooth muscle cells (stained for alpha smooth muscle actin (αSMA) in green) associate with the endothelium and extend processes along the vessel wall and act as perivascular cells as seen in the orthogonal projections 31. Images shown in panel A and B are reproductions from an earlier publication 31. C. Angiogenic sprouting and remodeling can be evaluated in engineered microvessels by modifying the culture media to include angiogenic stimuli. Without angiogenic stimuli, HUVECs show minimal sprouting (left); with angiogenic stimuli (1 µM small molecule inhibitor of GSK-3, 20 ng/ml vascular endothelial growth factor, and 20 ng/ml basic fibroblast growth factor), HUVECs readily sprout into the matrix as seen in top down projections and orthogonal views (right). The sprout length and number is easily quantifiable with ImageJ software 41. Please click here to view a larger version of this figure. Figure 4. Blood-endothelium Interactions. Engineered microvessels are quiescent and respond appropriately to inflammatory stimuli. A. An unmodified, HUVEC cultured vessel photographed near the inlet shows strong CD31 junctional staining (red) and a round, open lumen. A'. Orthogonal view of the lumen is shown. B. When citrated whole blood with CD41a-labeled platelets (green) is perfused through a similarly quiescent vessel, minimal adhesion of platelets (green) to the endothelium is observed. C. With exposure to inflammatory stimuli such as phorbol-12-myristate-13-acetate (PMA, 50 ng/ml) to the media, perfusion of whole blood results in the formation of large thrombi (CD41a-labeled, green) within the channel and adhesion of leukocytes (CD45+ labeled, white) to the vessel wall 31. Images seen here are reproduced from an earlier publication 31. Please click here to view a larger version of this figure. Figure 5. Microvessels Generated with Human Stem Cell Derived-ECs. Additional endothelial cell sources can be used to generate engineered microvessels. Earlier this year, Palpant et. al. demonstrated that two distinct subtypes of human embryonic stem cell-derived endothelial cells can be obtained by manipulating wnt/β-catenin signaling during differentiation: hemogenic endothelial cells (characterized by expression of HAND1 and a high hemogenic potential) and endocardial-like endothelial cells (characterized in part by expression of NFATC1 and GATA4) 41. A. When seeded and cultured in the 3D vessel platform, hemogenic ECs undergo some angiogenic sprouting. B. However, the endocardial-like ECs are much more angiogenic and migratory, suggesting functional differences, perhaps in response to flow, between the two subtypes of ECs (this work is presented in more detail in a previous publication 41). Both cell types express CD31 junctional proteins (red) and some VWF (green). Orthogonal views of both show patent lumens. C. A scanning electron microscope image of the endocardial-like ECs within the vessel shows an angiogenic sprout as seen from the luminal side. Images presented in panels A and B are reproductions from Palpant et. al. 41. Please click here to view a larger version of this figure. Engineered microvessels are an in vitro model where physiological characteristics such as luminal geometry, hydrodynamic forces, and multi-cellular interactions are present and tunable. This type of platform is powerful in that it offers the ability to model and study endothelial behavior in a variety of contexts where the in vitro culture conditions can be matched to that of the microenvironment in question. For example, the mechanisms driving endothelial processes, such as angiogenesis, are known to occur differently in different organs and in different pathological states, such as health and disease 44. For this reason, planar endothelial cell culture is consistently inadequate 6 and as such the field has relied heavily on costly and time consuming animal models. Animal models, while informative and essential for the progress of biological research, do not always translate well to the clinic. This has been largely attributed to differences between murine and human biology, particularly regarding their response to stimuli 9,45. It is therefore essential to be able to build in vitro models that can provide additional human-specific data to complement information gleaned from animal models. In vitro platforms have the potential to mimic the microenvironment of interest with the additional capacity to tune that environment. Key characteristics of such a system should include three dimensional structure and geometry, extracellular matrix composition (ECM), parenchymal cell proximity and interaction, blood flow, and biochemical stimuli. Engineered microvessels have the capacity to incorporate all these parameters. This can be done simultaneously to create an all-encompassing model, or added in a step wise manner to isolate individual responses and interactions. A powerful aspect of engineered microvessels is the ability to control flow and manipulate the hydrodynamic forces exerted on the endothelium. As an example, the device can be cultured under gravity driven flow conditions or with continuous perfusion (Figure 2). The magnitude of the shear stress on the vessel wall can be modulated in both conditions through changes in flow rate and the vessel geometry. The main difference between the two conditions is the temporal distribution of shear stress within the vessel. In gravity driven flow conditions, the shear stress is not constant over time. The flow rate and shear stress are highest immediately after a media change when the inlet reservoir is full. As the media drains, the shear stress will decrease. This leads to a range of shear stress over the course of 12 hr. Experiments which require precise control over the hydrodynamic properties (for example, to study the effects of shear stress on the endothelium) should use continuous flow culture conditions. Engineered microvessels can be tuned to answer a wide range of questions with relatively easy modifications. Different cells types, both parenchymal and endothelial, can be used to model different organ systems. In addition to fabricating microvessels with endothelial cell seeding, epithelial cells could instead be used to line the channel for studies relating to the intestinal lining, lung alveoli, kidney tubule, etc. Once the microenvironment is defined by cell composition, the nutrient solution (i.e., media, blood, growth factors, or other biologically relevant fluid) that is used to perfuse the device can be changed to answer complex questions about cell signaling, quiescence, shear stress, nutrients, drug response, and more. Furthermore, the geometry of the vessel can be specifically designed to investigate endothelial response to shear stress and tortuosity. As an example, a recent publication from Zheng et. al. showed that endothelial cells have increased VWF secretion and fiber assembly in microvessel regions with high shear stress and flow acceleration. Specifically, VWF bundles typically formed at corners and sharp turns within the network. The network geometry can also be designed to fabricate multi-cellular tubules. For example, a design that contains two parallel channels each with their own inlet and outlet could be used to generate a concentration gradient or to model an adjacent tubule environment (e.g., lymphatic vessel with adjacent microvessel). The grid-like structures of current network designs (shown in Figure 1A-C) are advantageous for computational fluid modeling and for structural integrity during fabrication, but are not indicative of vascular structure in the body. In future studies, more physiological network patterns such as ones with hierarchical branching and rounded corners should be used. While all the steps outlined in this procedure are important, there are several critical steps that are required for successful engineered microvessel fabrication. The collagen gel must be mixed thoroughly to achieve a homogenous solution, and it is essential not to introduce bubbles during this step. This is essential for cell viability and physiological function, particularly for experiments which include parenchymal cells in the collagen matrix. If a uniform mixture of the collagen is difficult to obtain, check the pH of the solution to ensure it is neutral. If the problem persists, it's possible the collagen stock should be replaced. Another critical step is the assembly of the top and bottom housing pieces - it is essential not to use undue force as this can cause the channels to collapse. Several practice rounds may be necessary to obtain a sense of the amount of force needed to apply while rotating screws. If channel collapse or smashing continues to occur even after practice, it is possible the PDMS network has become warped due to absorption of moisture. Starting with freshly made PDMS molds will help solve this problem. Improperly threaded holes in the bottom device can also cause channel collapse. If the screws are not able to rotate smoothly during assembly, extra force must be applied often resulting in structural failure. The last critical step that should be emphasized is the importance of frequent feeding, typically every 12 hr. This is essential for maintaining the endothelium and preventing the device from drying out. In the event that seeded endothelial cells appear unhealthy or detach from the collagen wall, potential ways to improve endothelial health are to feed the vessels more often, use a syringe pump to apply continuous flow, or check the pH of the collagen gel to ensure it is at a physiological level. Currently, this platform is limited to fabrication with extracellular matrix of appropriate stiffness to maintain structural integrity of the channel during assembly. Dense collagen at or greater than 6 mg/ml is sufficient, but collagen less than 6 mg/ml and other matrices such as decellularized matrix from whole organs are too weak. This can be overcome by using a mixture of collagen with the matrix in question. Engineered microvessels are also limited by their size scale. Vessels can be fabricated to a lower limit of about 100 µm, but substantial modifications would need to be applied to achieve a smaller scale. Although engineered microvessels create a three dimensional lumen, the network itself is planar. To create a truly three dimensional vascular plexus, additional modifications would need to be applied such as creating a multilayered network by stacking multiple engineered vessels. The representative results presented in this method demonstrate how engineered microvessels can be used to assess barrier function, cell-cell signaling (pericyte recruitment and vascular stabilization), angiogenesis, and thrombosis. Highlights of these studies are presented here with more detailed presentations in previous publications 31,32. These studies show how pericytes migrate and coat the endothelium of engineered microvessels 31, platelets adhere to activated endothelium 31, and fluid shear stress modulates endothelial activation and VWF secretion and assembly 32. Engineered microvessels can further be used to build vascularized tissues and model organ-specific systems, such as the kidney 33 or the heart 34. The ability to replicate these physiological blood-endothelium interactions and tune the microenvironment with respect to shear stress, geometry, ECM, and cellular composition will enable future studies of vascular diseases. The authors would like to acknowledge the Lynn and Mike Garvey Imaging Laboratory at the Institute for Stem Cell and Regenerative Medicine as well as the Washington Nanofabrication Facility at the University of Washington. They also acknowledge the financial support of National Institute of Health grants DP2DK102258 (to YZ), and training grants T32EB001650 (to SSK and MAR) and T32HL007312 (to MAR). 8" silicon wafer Wafer World Inc.
Rubanyi, G. M. The role of endothelium in cardiovascular homeostasis and diseases. J. Cardiovasc. Pharmacol. 22, Suppl 4 37-44 (1993). van Hinsbergh, V. W. The endothelium: vascular control of haemostasis. Eur. J. Obstet. Gynecol. Reprod. Biol. 95, (2), 198-201 (2001). Chiu, J. -J., Chien, S. Effects of Disturbed Flow on Vascular Endothelium: Pathophysiological Basis and Clinical Perspectives. Physiol. Rev. 91, 327-387 (2011). Qi, Y., Jiang, J., et al. PDGF-BB and TGB-b1 on cross-talk between endothelial and smooth muscle cells in vascular remodeling induced by low shear stress. Proc. Natl. Acad. Sci. U. S. A. 108, 1908-1913 (2011). Sozzani, S., Del Prete, A., Bonecchi, R., Locati, M. Chemokines as effector and target molecules in vascular biology. Cardiovasc. Res. 107, (3), 364-372 (2015). Huh, D., Hamilton, G. A., Ingber, D. E. From 3D cell culture to organs-on-chips. Trends Cell Biol. 21, (12), 745-754 (2011). Staton, C. a, Reed, M. W. R., Brown, N. J. A critical analysis of current in vitro and in vivo angiogenesis assays. Int. J. Exp. Pathol. 90, 195-221 (2009). Greek, R., Menache, A. Systematic Reviews of Animal Models: Methodology versus Epistemology. Int. J. Med. Sci. 10, 206-221 (2013). Can Animal Models of Disease Reliably Inform Human Studies. PLoS Med. van der Worp, H. B., Howells, D. W., et al. 7, (3), e1000245 (2010). Leong, X. -F., Ng, C. -Y., Jaarin, K. Animal Models in Cardiovascular Research: Hypertension and Atherosclerosis. Biomed Res. Int. 2015, 528757 (2015). Pries, A. R., Secomb, T. W. Making Microvascular Networks Work: Angiogenesis, Remodeling, and Pruning. Physiology. 29, 446-455 (2014). D'Amore, P. Mechanisms Of Angiogenesis. Annu. Rev. Physiol. 49, 453-464 (1987). Geudens, I., Gerhardt, H. Coordinating cell behaviour during blood vessel formation. Development. 138, 4569-4583 (2011). Ribatti, D., Nico, B., Crivellato, E. The development of the vascular system: a historical overview. Methods Mol. Biol. 1214, 1-14 (2015). Ribatti, D., Nico, B., Crivellato, E. Morphological and molecular aspects of physiological vascular morphogenesis. Angiogenesis. 12, (2), 101-111 (2009). Bautch, V. L. VEGF-directed blood vessel patterning: From cells to organism. Cold Spring Harb. Perspect. Med. 2, (9), 1-12 (2012). Stratman, A. N., Schwindt, A. E., Malotte, K. M., Davis, G. E. Endothelial-derived PDGF-BB and HB-EGF coordinately regulate pericyte recruitment during vasculogenic tube assembly and stabilization. Blood. 116, 4720-4730 (2010). Bach, T. L., Barsigian, C., et al. VE-Cadherin mediates endothelial cell capillary tube formation in fibrin and collagen gels. Exp. Cell Res. 238, (238), 324-334 (1998). Kubow, K. E., Conrad, S. K., Horwitz, aR. Matrix microarchitecture and myosin II determine adhesion in 3D matrices. Curr. Biol. 23, (17), 1607-1619 (2013). Potapova, I. A., Gaudette, G. R., et al. Mesenchymal Stem Cells Support Migration, Extracellular Matrix Invasion, Proliferation, and Survival of Endothelial Cells In Vitro. Stem Cells. 25, (7), 1761-1768 (2007). Bayless, K. J., Davis, G. E. Sphingosine-1-phosphate markedly induces matrix metalloproteinase and integrin-dependent human endothelial cell invasion and lumen formation in three-dimensional collagen and fibrin matrices. Biochem. Biophys. Res. Commun. 312, (4), 903-913 (2003). Hellström, M., Gerhardt, H., et al. Lack of pericytes leads to endothelial hyperplasia and abnormal vascular morphogenesis. J. Cell Biol. 152, (3), 543-553 (2001). Tulloch, N. L., Muskheli, V., et al. Growth of Engineered Human Myocardium With Mechanical Loading and Vascular Coculture. Circ. Res. 109, 47-59 (2011). Davis, G. E., Saunders, W. B. Molecular balance of capillary tube formation versus regression in wound repair: role of matrix metalloproteinases and their inhibitors. J. Investig. dermatology Symp. 11, (1), 44-56 (2006). Kannan, R. Y., Salacinski, H. J., Butler, P. E., Hamilton, G., Seifalian, A. M. Current status of prosthetic bypass grafts: a review. J. Biomed. Mater. Res. B. Appl. Biomater. 74, 570-581 (2005). Nerem, R. M., Seliktar, D. Vascular Tissue Engineering. Annu. Rev. Biomed. Eng. 3, (1), 225-243 (2001). Melchiorri, A. J., Hibino, N., Fisher, J. P. Strategies and techniques to enhance the in situ endothelialization of small-diameter biodegradable polymeric vascular grafts. Tissue Eng. Part B. Rev. 19, (4), 292-307 (2013). Abbott, W. M., Callow, A., Moore, W., Rutherford, R., Veith, F., Weinberg, S. Evaluation and performance standards for arterial prostheses. J. Vasc. Surg. 17, (4), 746-756 (1993). Niklason, L. E. Functional Arteries Grown in Vitro. Science. 284, (5413), 489-493 (1999). Niklason, L., Counter, C. Blood vessels engineered from human cells - Authors' reply. Lancet. 366, (9489), 892-893 (2005). Zheng, Y., Chen, J., et al. In vitro microvessels for the study of angiogenesis and thrombosis. Proc. Natl. Acad. Sci. U. S. A. 109, 9342-9347 (2012). Zheng, Y., Chen, J., Lòpez, J. A. Flow-driven assembly of VWF fibres and webs in in vitro microvessels. Nat. Commun. 6, 7858 (2015). Ligresti, G., Nagao, R. J., et al. A Novel Three-Dimensional Human Peritubular Microvascular System. J. Am. Soc. Nephrol. 27, (2015). Roberts, M. A., Tran, D., et al. Stromal cells in dense collagen promote cardiomyocyte and microvascular patterning in engineered human heart tissue. Tissue Eng. Part A. (2016). Qin, D., Xia, Y., Whitesides, G. M. Soft lithography for micro- and nanoscale patterning. Nat. Protoc. 5, (3), 491-502 (2010). Alpha-Step 200 Manual. Tencor Instruments. (1989). Rajan, N., Habermehl, J., Coté, M. -F., Doillon, C. J., Mantovani, D. Preparation of ready-to-use, storable and reconstituted type I collagen from rat tail tendon for tissue engineering applications. Nat. Protoc. 1, (6), 2753-2758 (2006). Baudin, B., Bruneel, A., Bosselut, N., Vaubourdolle, M. A protocol for isolation and culture of human umbilical vein endothelial cells. Nat. Protoc. 2, (3), 481-485 (2007). Leung, A. D., Wong, K. H. K., Tien, J. Plasma expanders stabilize human microvessels in microfluidic scaffolds. J. Biomed. Mater. Res. - Part A. 100, (7), 1815-1822 (2012). Tousimis SAMDRI-780 Critical Point Drying Apparatus. Tousimis Research Corporation. (1987). Palpant, N. J., Pabon, L., et al. Inhibition of β-catenin signaling respecifies anterior-like endothelium into beating human cardiomyocytes. Development. 142, (18), 3198-3209 (2015). Gimbrone, M. a, Topper, J. N., Nagel, T., Anderson, K. R., Garcia-Cardena, G. Endothelial Dysfunction, Hemodynamic Forces, and Atherogenesis. Thromb. Haemost. 82, 722-726 (1999). Wu, M. H., Ustinova, E., Granger, H. J. Integrin binding to fibronectin and vitronectin maintains the barrier function of isolated porcine coronary venules. J. Physiol. 532, (3), 785-791 (2001). Ribatti, D., Nico, B., Vacca, A., Roncali, L., Dammacco, F. Endothelial cell heterogeneity and organ specificity. J. Hematother. Stem Cell Res. 11, 81-90 (2002). Shanks, N., Greek, R., Greek, J. Are animal models predictive for humans. Philos. Ethics. Humanit. Med. 4, 2 (2009).